I did a cleanse recently and it was amazing. It definitely made me think a lot more about what I’m putting in my body and I think that’s a GREAT thing. For that reason, I think the idea of beauty ingestibles is probably a good one because a) they make you think about beauty from the inside out and b) they make you drink liquid (water, tea, a smoothie to throw them in), and I am never hydrated enough. 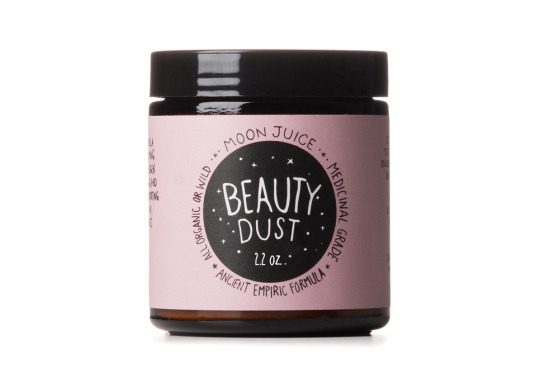 Moon Juice was created by Amanda Chantal Bacon because she wanted to introduce a new way of living. Inspired by her own struggles with hypothyroidism, she began studying the power of raw, medicinal foods that would be healing to her specific condition. I actually first read this as “alkalizing” meaning effecting pH level, and I was like, OK I guess I understand how that could positively effect your body, but alchemizing means turning elements to gold basically through magic. That lead me to research each ingredient because I know alchemy is not actually happening in my body when I eat this, since alchemy is not real. I know Goji (from the berry) is an antioxidant and the rest are herbs (and pearl) used in traditional Chinese medicine (you can research them all like I did, or if you’re reading this and a practitioner, please comment! ), and stevia which is a sweetener. I began to ask myself, why - when I put whatever on my skin, which is the body’s largest organ, sometimes not really buying the ingredient story and not caring at all because I’ve been in this industry forever and I know topical products can only do so much for your hair and skin but nice packaging and product feel can really make you feel good and that’s part of the joy of all this - am I going so deep on this darn dust? In addition to a) loving beauty and taking care of myself, I also b) love opening people minds to other paths of self-care, and c) good marketing – and I can honestly say that I use and personally love this product but I’m not sure for which reason(s). This is true of a lot of products I use for beauty, but because this is a new territory (ingestible), I think it made me think about it more and really consider why I was choosing to add this to my routine. It poses an interesting question for me on the wellness “category” - will people be willing to buy in, or does eating something change your “sniff” test on the believe-ability of the claims? (Certain skin and haircare claims do have to be validated by studies but many supplement ‘claims’ are unregulated by the FDA - which is a long long topic). So I ask you - WHAT DO YOU THINK? What beauty ingestibles have you tried? Hype or it’s happening for you?